What is the shape of the universe? From where we sit it appears flat. However, could it be shaped as a sphere? Read on to learn more about the shape of the universe. For a very long time, men believed that the Earth was flat. People accepted that idea and went along with it all their lives. Maps were drawn that depicted the edge of the Earth. Furthermore, they were also drawn with sea monsters shown for good storytelling effects. Based on the images sent back by telescopes, we know that the Earth is indeed round. Sailors do not fall off the edge of the Earth as they travel around the globe. What about the universe? Can we tell what whether it is flat or more of a sphere like our Earth? Unfortunately, we cannot fly far above and look down upon it. However, scientists have some ideas of what they believe it looks like. 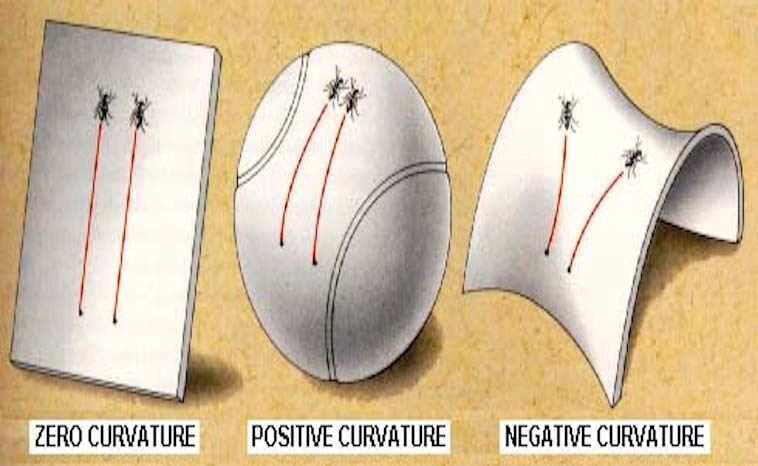 To understand what a positive curve would look like you would need to get a balloon. Draw a line around the shape of the balloon. Now draw a line the opposite side of the first lines. The second line will intersect with the first line before it completes its trip around the balloon. This example would contain a large amount of energy. Gravity would need to exist in large quantities against energy in order to keep the shape of a sphere. In order to have this type of closed universe, then the universe itself would need to stop expanding. At this time scientists believe that the universe continues to expand. If space has a negative curvature, there is insufficient mass to cause the expansion of the universe to stop. As a result, it has no bounds and will expand forever. Think of a horse saddle. Two objects leaving from the same point would never intersect. This is called an open universe. However, if the density exactly equals the critical density, we see it as flat, like a sheet of paper, and infinite in extent. To arrive at these conclusions mathematicians and scientists use geometry. “Density parameter” expresses the ratio between densities. The ratio would measure the actual density of the universe to the critical density. Basically, what would it take for the expansion to stop? From 2001 to 2010, NASA used their Wilkinson Microwave Anisotropy Probe to measure the universe. When they looked at the data, they determined that the curvature of space lies within 0.4% of “flat” Euclidean. A “flat” universe is said to be at “critical density”, having 100% of the matter and energy needed to be “flat”. Why do scientists find this information so important? They use this information to determine the age of the universe. Based on their calculations, they believe it to be 13.77 billion years old. What do you think? Do you think it is flat? a cylinder? a donut? Scientists today still look to answer this question and maybe someday we will know for sure. Christmas Trivia; Did You Know…? Some of Cassini’s Most Fabulous Saturn Pics! Five Planets All In a Row? Oh Yeah! Twinkle, Twinkle Little Star…Not a Planet!